Finished size: @ 6-3/4 "X 4-3/4 "
Description: This small sampler is packed with specialty stitches and lots of lovely autumn colors, including overdyed silk thread from Gloriana. Leaf motifs, harvest-time fruits, knotwork motifs, some cutwork and beads are all represented. The piece contains both over-one and over-two stitching. 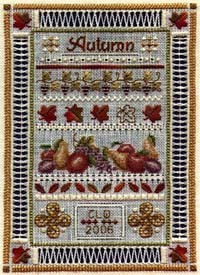 Background Information: Over the years I've received many requests for a series of smaller seasonal samplers. Autumn Sampler is the first such offering. I live in the middle of the lovely Pennsylvania mountains, surrounded by some of the most gorgeous fall foliage in the country... so for inspiration for this design, I didn't need to go far! Stitching Comments: Miniature Autumn Sampler was designed as a teaching piece, so the instructions are very concise (and have been tested by the students who took the class!) It's challenging, but since it's small, it's a project that can be completed in a reasonable amount of time. I'd recommend using a stitching frame for this piece to maintain even tension as many of the specialty stitches are pulled tightly, which tends to distort the fabric. Specialty Stitches: attaching beads, plait stitch, herringbone stitch, four-sided stitch, cutwork, hemstitch,smyrna diamond stitch, plaited cross stitch, lazy daisy stitchdiagonal and regular satin stitches, algerian eyelet, long-armed cross stitch, three-sided stitch.